(CNSNews.com) - "PRESIDENTIAL HARASSMENT! It should never be allowed to happen again!" President Trump tweeted on Thursday morning, one day after the Democrat-led House intelligence committee announced it was launching an investigation into "credible reports of money laundering and financial compromise related to the business interests of President Trump, his family, and his associates." -- The Dems and their committees are going “nuts.” The Republicans never did this to President Obama, there would be no time left to run government. I hear other committee heads will do the same thing. Even stealing people who work at White House! A continuation of Witch Hunt! 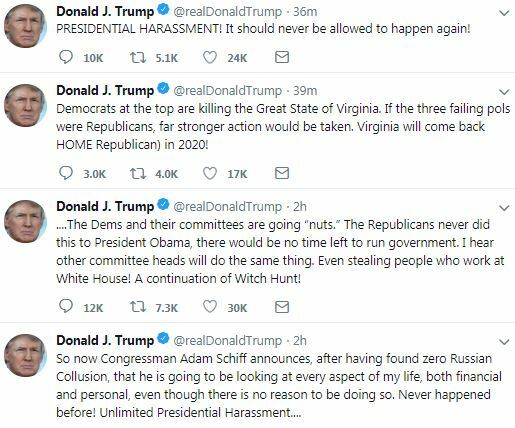 Trump also railed against Democrat hypocrisy in Virginia, where two of the commonwealth's top three Democrats have admitted to racist behavior; and the third is denying accusations of long-ago sexual assault. "Democrats at the top are killing the Great State of Virginia," Trump tweeted. "If the three failing pols were Republicans, far stronger action would be taken. Virginia will come back HOME Republican) in 2020!" Well, it's necessary because it was never completed as part of the original investigation. It wasn't as if we didn't want to pursue whether or not there was Russian money coming in to Trump properties. It was just that the Republicans were resistant to doing anything that would have investigated that particular relationship. It's important because from an intelligence perspective, we need to make sure that the president of the United States is putting America first, not Russia or some other country. I have thought for a very long time that the president, as a real estate developer, had violated what's called the Foreign Corrupt Practices Act. It is a requirement that anyone doing business with a foreign entity make sure that none of the money that comes into a project has been laundered. And it's a concept that's hard for the average person to appreciate -- what is money laundering? It's going to be our job to explain that to the American people and to determine whether or not in many of the projects, I've focused in on three, the Toronto project, the Soho project, and the Panama project, all Trump hotels, all of which went belly up at a time, particularly in the Toronto project, where not one other high rise property was bankrupted. But the Trump property was. Speier said intelligence committee members do not know what the Mueller team may be investigating, or even if they'll ever get to see the final Mueller report. But regardless, she said it's important for Congress to conduct its own oversight of the executive branch. "He is basically saying, as he said in his State of the Union, we will not have peace, we will not have legislation if you investigate me. Well, that's -- you're not going to intimidate the Congress of the United States, Mr. President. We are two equal branches of government, and he still hasn't learned his civics 101 class, I'm afraid."